Lemon Harangue Pie: "Your perfectly pristine papers, please"
If you're going to be traveling abroad, you'll want to make sure your passport is in pristine condition. One Denver family found that out the hard way. Kyle Gosnell, his wife Dana, and son Kye were on their way to Belize on vacation. They went through airport security in Denver without any problems and received boarding passes all the way through to Belize city. 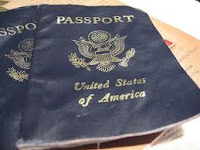 While switching planes in Dallas, however, Kyle was told his passport was mutilated, and therefore unacceptable. The family was not allowed to board their plane, and American Airlines put them up in a hotel for the night. It seems that if an airport employee has a difficult time scanning a passport, he or she can refuse passage. (Why is the Bridge of Death scene from Monty Python and the Holy Grail suddenly springing to mind?) The Gosnells, meanwhile, just want to see some changes made so that airport policies regarding passports are more uniform. On the bright side, the family got a partial expense-paid night in Dallas. Yeehaw.